this springtime cake recipe is dedicated to all you Moms out there! and for ensuring we never go to bed hungry! Just before jettisoning to my first official family vacation in over 5 years (insert glad face here) I made this cake. 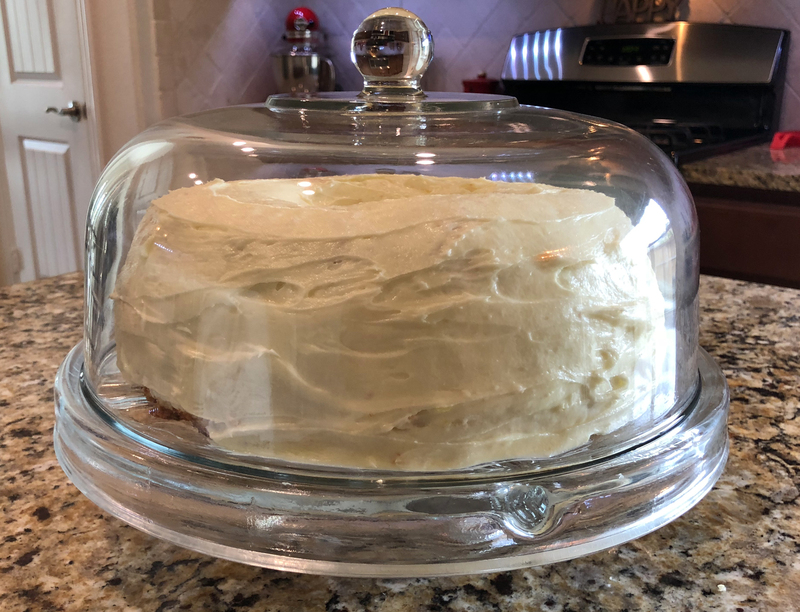 Before I dive into why you should make it, too, I want to share a crazy family story connection with this recipe! 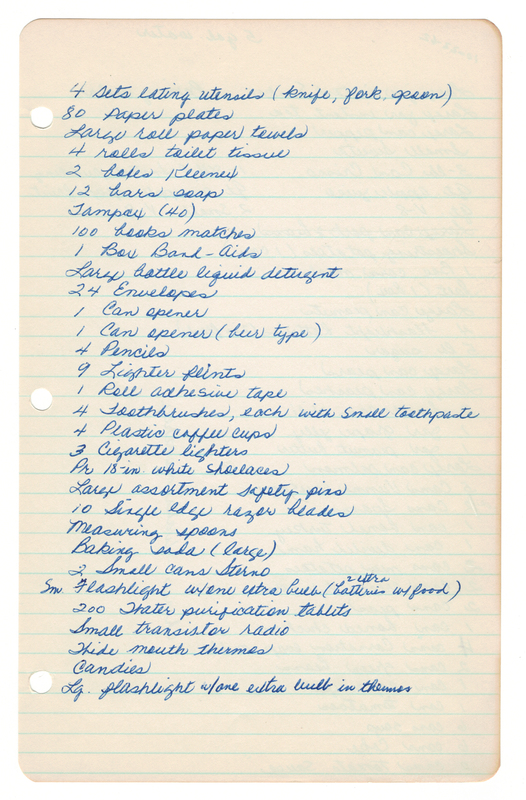 Before leaving for the Texas Coast I was reminded of a list I recalled that was tucked away in my Mom “Betty’s” cookbook. 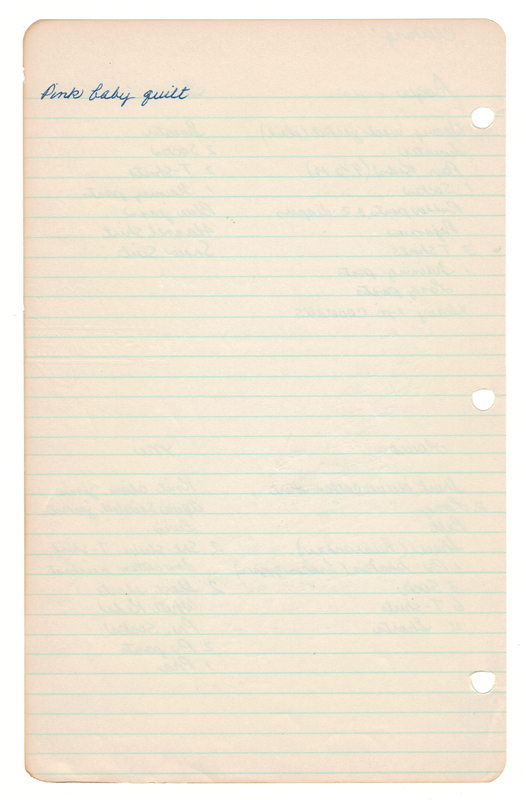 For 7 years I had thought it was a list Mom wrote in preparation for an October trip to the coast to enjoy the temperatures of the beachy, breezy 70s and 80s which is quite delightful after the typical blazing Texas summer. Since I was reminded of the beachtime list I snapped a few pics of the list (below) and texted them to my Dear Cousin Alison, who is as much a fellow Foodie as one could hope for. She and I texted back and forth while Joe drove me and the Dogs to Port Aransas… somewhere around Refugio, Texas, I had a huge revelation – the list wasn’t for a family vacation, it was preparing for an e-vacuation! What Chew Talking About, Willis? 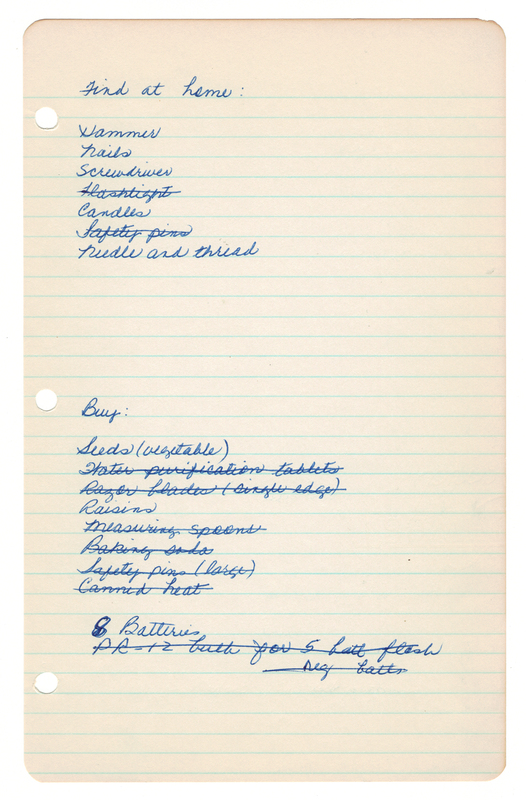 I stumbled across the date “10-22-62” that was written off to the side of my Mom’s list and after seeing my Googled search results my heart started beating faster. My family wasn’t about to to go on a joyride trip – they were preparing for the Cuban Missile Crisis! I had heard about the Cuban Missile Crisis before, but I didn’t realize its potential for devastation here on U.S. soil. Aggressively searching on Google for more clues about this date and it’s significance to San Antonio I stumbled upon a passage from the book A Tale of Three Cities (authored by R. Douglas Brackenridge and published by Trinity University). Sobering. As a alum of Trinity University, there’s no doubt Mom’s ties to her alma mater rang loud during this scary time. 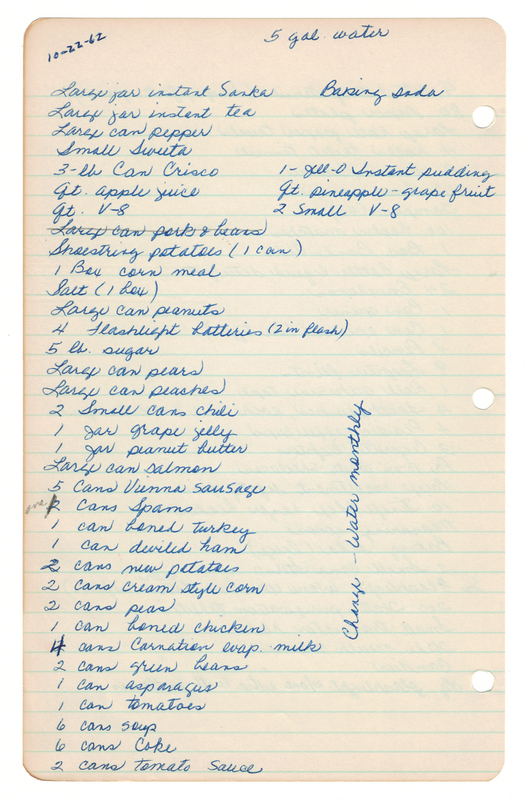 Even more so, I was amazed how – once again – a simple recipe from Mom’s cookbook could unearth so much history and relevancy to my family. Um, Did You Forget About The Cake? The checkerboard cake pattern. 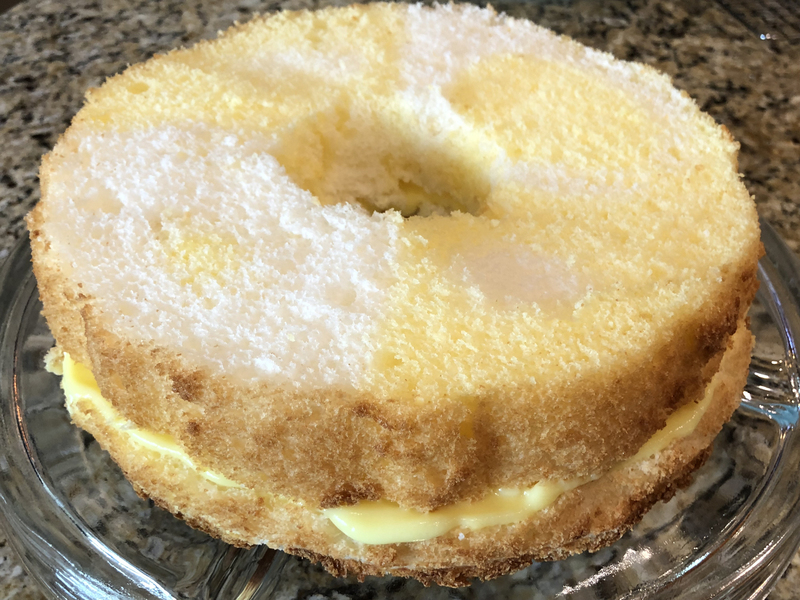 50+ years ago alternating yellow and white cake was surely quite a surprise, cleverly “hidden” beneath the lemony frosting. Layered pudding cake. Need I say more? The tart and sweet taste of the lemon frosting. 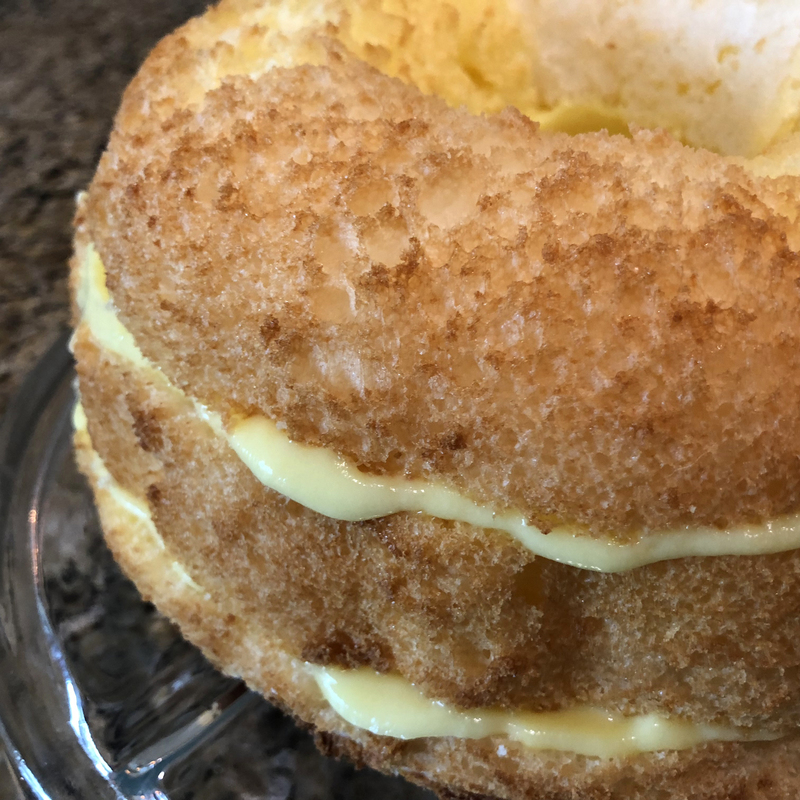 You can peel off the frosting recipe and make it for cupcakes or any other cake where you want a citrusy lemon appeal. 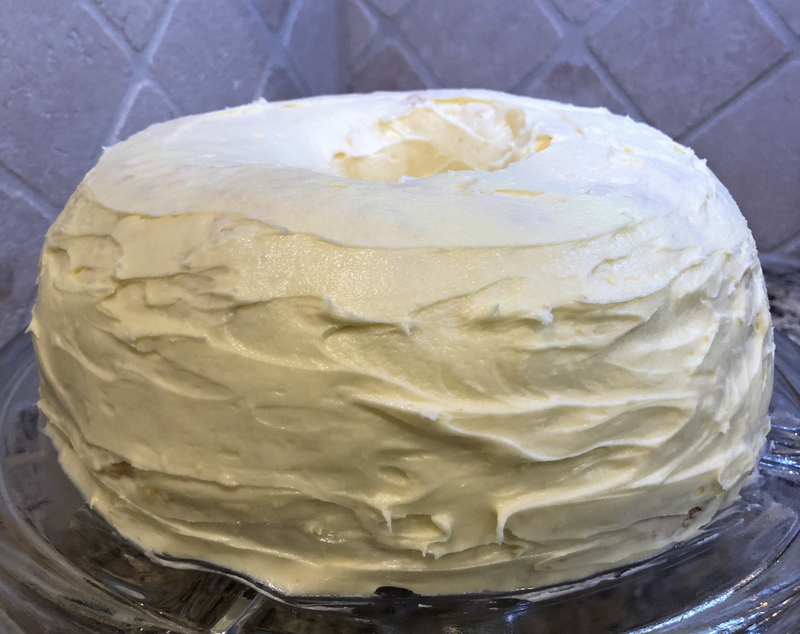 ❤ Mom’s Options For The Frosting: 1) Mix lemon juice into 2 packages (7 ounces each) butter-cream style frosting mix or; 2) Make your own delicious Lemon-Butter Frosting compliments of Mom’s recipe that pairs wonderfully with this cake! The instructions below presume we will be making scratch frosting, since that’s how I enjoyed it. 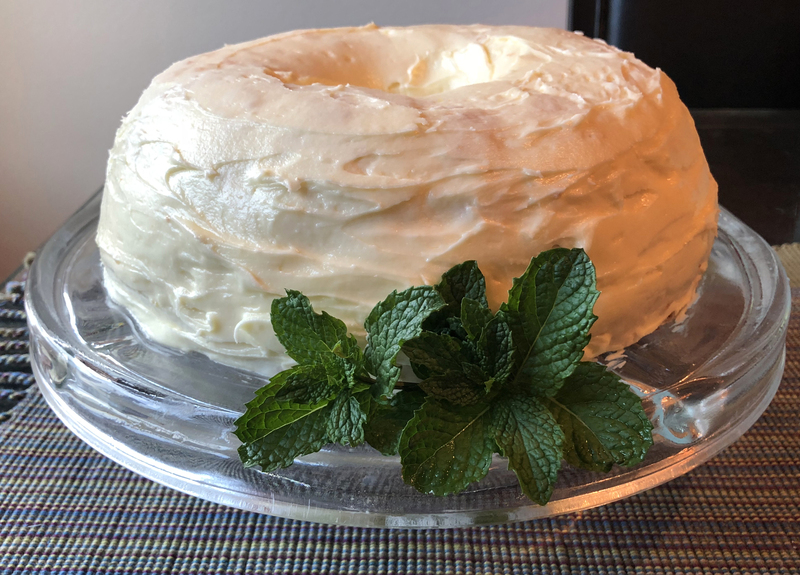 The scratch frosting was super-simple to make and the taste was excellent! ❤ Tube pan vs. bundt pan. I didn’t know the difference until I was already into baking this recipe! Luckily my bundt wasn’t extremely fluted and the cake popped right out. But I was panicking that the batter was going to ooze all over my oven as the tube pan holds a little more batter than the typical bundt. Total prep: About 2 hours, including baking, cooling and chilling. 0. Preheat your oven to 375°F. 2. 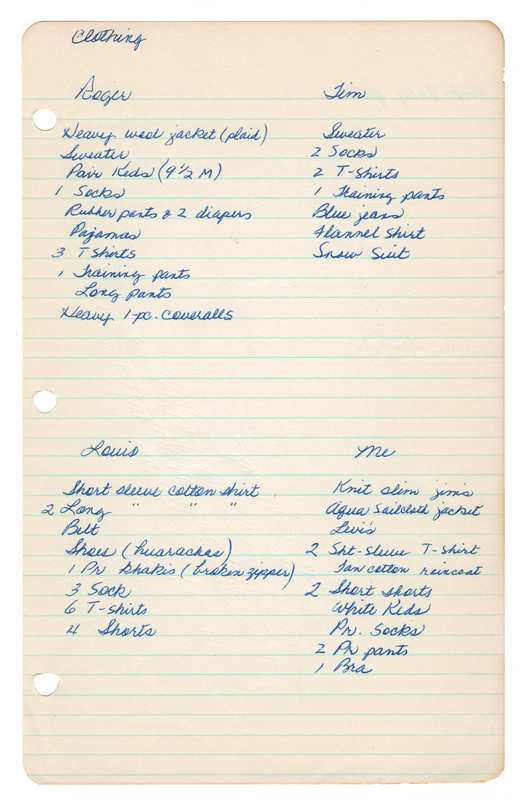 Fill an ungreased 10-inch tube pan with alternating spoonfuls of yellow and white batters. Do not stir! I wound up with 3 layers of alternating colored batters in total; yours may vary. 3. Bake your cake mix in your preheated oven about 1 hour, or until done. 4. Remove the cake from the oven, turn the pan upside down onto a wire rack and cool completely. 5. Prepare the instant pudding mix and chill it about 10 minutes to allow it to thicken. 6. Loosen and turn out the cake (mine literally fell out of the pan). 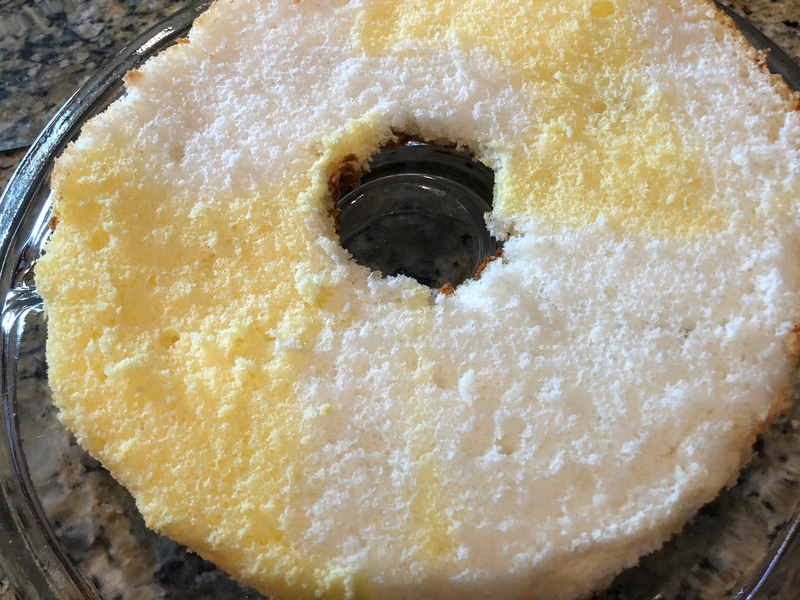 Using a large serrated knife to slice the cake into 3 horizontal layers. Spread the pudding between layers leaving the top of the cake plain. 7. Frost the top and sides of the cake (frosting recipe below). 1. With a hand mixer cream the butter until soft. 2. Blend in the egg yolks. 3. Add sugar a little at a time and alternate with the lemon juice. 4. Blend until everything is thick and creamy-smooth. The suspense is killing me! Let’s frost the cake and get to it! Despite my excitement to devour this I was able to wait and chill my cake for 15 minutes or so. This step is totally optional but I like my citrusy cakes chilled and refreshing. Ready for my Mom’s Cuban Missile evacuation lists? Here they are followed by a few comments from the “me” of today to yesterday. Pink Baby Quilt – Since Mom and Dad only had two boys I thought this one was interesting. Then I was reminded that ultrasounds didn’t become popular until the 1980s so undoubtedly they received a pink blanket for what turned out to be baby boys. Surprise! Water (5 Gallons) and Toilet Paper (4 rolls): I found these quantities disproportionate to what I would insist upon – more like 80 rolls of toilet paper and 5 boxes of wine… to get me through the weekend. Bonus Reading Below: My Cousin Alison gave me links to so many awesome references about nuclear fallout. I know it’s weird to be posting about them here, but they are a blast from the past, so I’m sharing them.